I loved Towles’ first book The Rules of Civility and read it in its entirety one afternoon sitting on a cruise ship sun deck. 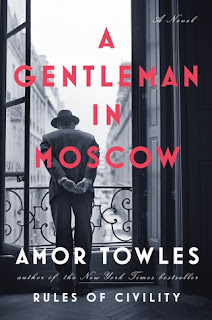 So I had every intention of reading his second book, A Gentleman in Moscow, but I kept hesitating because of the size and what sounded like an iffy plot. But, I was offered a freelancing opportunity involving this book, so I had the perfect reason to read it. And, I was so wrong about the size and plot. This book, y’all, is one our kids will read in school. I do not say that often because there are plenty of great classics already on the reading lists, and many excellent books are slowly making their ways to that lofty list. However, out of the thousands of books that are published every year, very very few of them will be on that required school reading list. I am willing to bet this one makes it there. Why? Because the story is unique, the characters are well developed, it is filled with symbolism and allusions, and the language is beautiful. Set almost entirely within the Metropol hotel in Moscow, Russia, the author has crafted a novel that is clearly reminiscent of the Russian greats; however, the added humor and playfulness of the novel makes it just as enjoyable (maybe even more so) to today’s audiences. The basic plot involves the Count being forced to live under permanent house arrest at the Metropol Hotel. The novel then tells his story of living and learning amongst the hotel staff and guests at this hotel. In the novel, two young girls cause the Count to view the hotel and the world in a new way. (I would love to say more, but I would spoil it big time.) While it sounds like this may be a bore, I assure you it is not. How fun was it to visit a hotel as a child? Now, imagine if you had a secret passkey to go anywhere you wanted to spy on others? Now, add in that you can dine daily at high-end restaurants with exquisite wine. Readers get to experience this unique life and meet a variety of nuanced characters. There are laughter, tears, and rejoicing. Not a traditional love story, but a book filled with love. And, the language. Oh my word. The language! The novel reads like poetry. Serious poetry and playful poetry. There is one literary reference after another – I finally stopped keeping track. Towles even includes entertaining arguments about the use of verbs, commas, and haikus. This litlovingmom was in heaven! I cannot recommend this book enough! Read it. * You may order this book from amazon here. This post contains affiliate links. Thank you for supporting my blog!